Pizza Night is becoming a regular event at my house. With the purchase of my Vitamix , I’ve been making pizzas far more often. 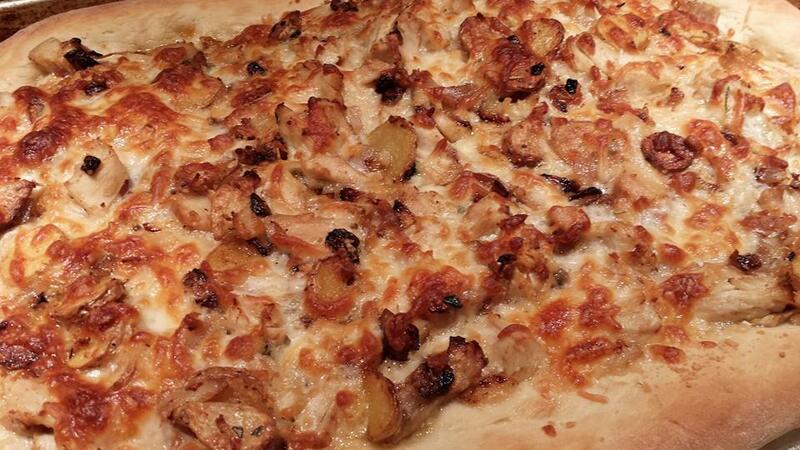 My Garlic Chicken Pizza with Fingerling Potatoes is a fancier option to the regular tomato-based pizza. 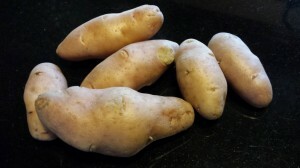 Fingerling potatoes are small potatoes that are generally sauteed or roasted. 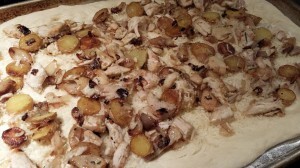 I like to use fingerling potatoes on pizzas, too. 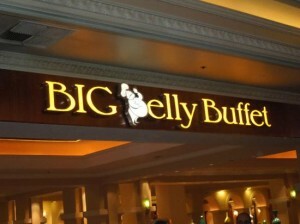 They add just enough of a potato taste, and don’t overwhelm the pizza. 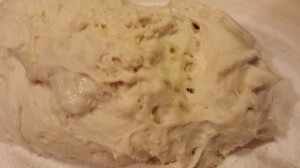 Start with a fresh pizza dough by rolling it out and putting it on a greased pizza pan. You can make your own dough, or purchase your favorite pizza dough. 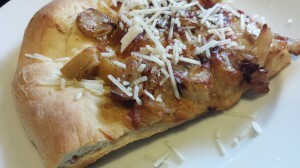 A Boboli crust works well for this pizza. Slice some fingerling potatoes into thin coins. Saute the potatoes in olive oil until cooked through. Chop some cooked chicken and add to the potatoes. You can use leftover cooked chicken or rotisserie chicken from the deli. Add some roasted garlic cloves and thyme. And heat through. Brush some olive oil on the pizza dough. Sprinkle some shredded Parmesan cheese over the pizza dough. Spread the potato chicken mixture evenly over the Parmesan cheese. Bake the pizza for 8 – 12 minutes until hot and bubbly. Remove the pizza from the pan and place on a cutting board to cool for a minute or so. 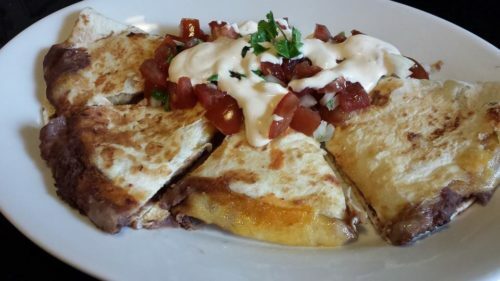 Slice, garnish with chopped parsley and shredded Parmesan cheese, and serve! 1. Preheat your oven to 450 degrees Fahrenheit. Roll out your pizza dough and place it on a greased pizza pan or baking sheet and let it rest. 2. Heat the olive oil over medium heat in a skillet. Saute the fingerling potato coins in the olive oil until they are a light golden brown and cooked through. 3. Add the chicken breast, whole roasted garlic cloves, and dried thyme to the potatoes and stir a bit. Warm through. 4. Brush the 2 T of additional olive oil evenly across the pizza dough including the edge/crust area. 5. Sprinkle the shredded Parmesan cheese evenly around the pizza dough. 6. 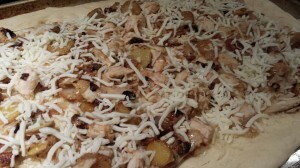 Top the Parmesan with the potato and chicken mixture, spreading evenly around the pizza dough. 7. Add the shredded mozzarella cheese on top of the pizza. 8. 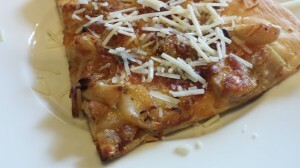 Bake for 8 – 12 minutes until the pizza crust edges are golden brown and the pizza topping is bubbling. 9. Remove pizza from the pan to a cutting board and let sit for a minute or two for easier slicing. 10. 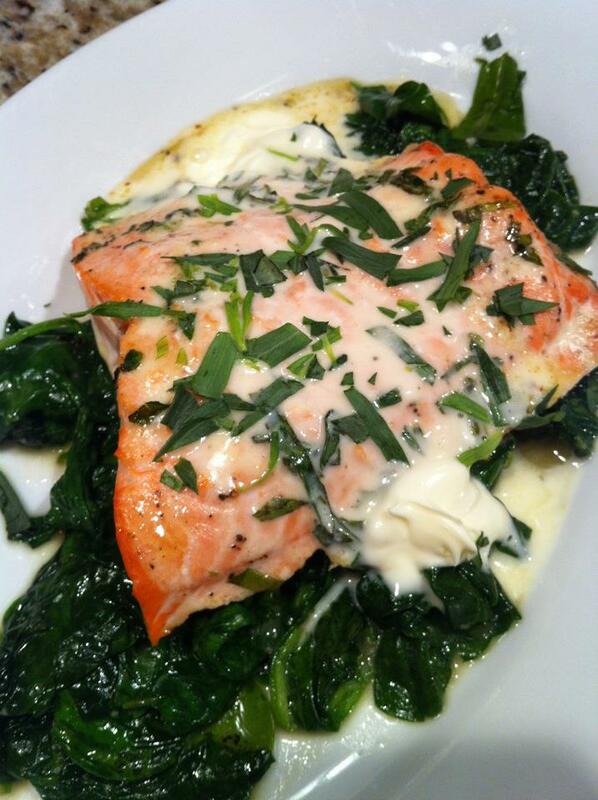 Slice into pieces, sprinkle on a bit more shredded Parmesan, some chopped parsley, a drizzle of olive oil, and serve! Serves 4 – 6 hungry diners. Serve alone or with a side salad such as my Insalata Caprese – Tomato and Mozzarella Salad or my Tomato and Cucumber Salad with Peppered Goat Cheese. Variations: Use pulled smoked chicken or pork for a wonderful flavor. Make this a vegetarian pizza and omit the chicken. Add mushrooms, peppers, or black olives. If you can’t find roasted garlic, and don’t want to make your own, just use regular garlic cloves, sliced. Use your favorite cheese — Havarti goes great on this pizza.